Twenty years from now, people will spend less time cooking and preparing food than they do today. Some people expect that they will spend less time cooking and preparing meals in the future. I doubt it. 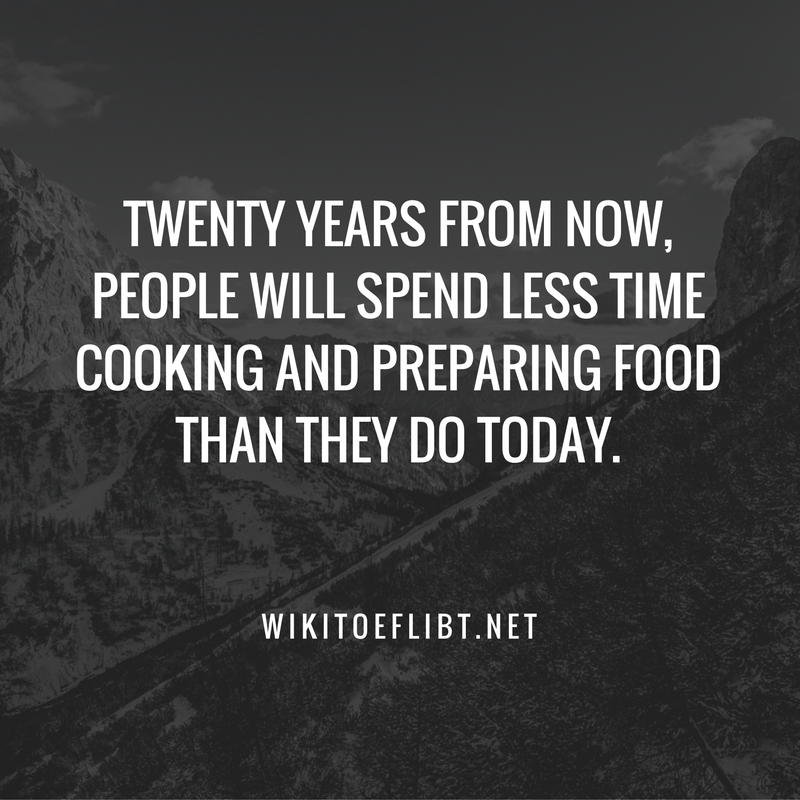 In fact, I believe that, twenty years from now, people will still spend about the same amount of time preparing food as they do today. First, more and more people enjoy cooking itself. Because cooking is relaxing to them, they are fine with spending an hour or two cooking a meal. My friend’s mother is one such person. Although she works eight hours a day, upon coming home, she spends a couple of hours cooking dinner. She really loves cooking. And her daughter, my friend, resembles her. She often helps her mother since cooking is fun. She will not mind if, in the future, she spends lots of time cooking. Even if appliances make preparing meals faster, she will likely make more elaborate meals. For my friend and her mother, cooking is not labor but a pastime. This is and will be true of many other people. Next, you cannot change how long it takes to cook some kinds of food. Of course, there are various instant foods that take five minutes to heat up. If you, however, want to cook a roast or stew properly, it will require several hours to cook. The slow cooker, which takes hours to cook meals, is popular these days. I am sure people in the future will still use that appliance because cooking food quickly is liable to ruin it. Proper cooking will still take lots of time in the future. Two decades from now, people will cook for the same amount of time as they do today. The number of people who enjoy cooking is on the increase, and the speed at which some food cooks cannot be decreased. In the end, cooking is an activity that requires enough time.